Once we have the building, we will sell prints, books and possibly other merchandise with proceeds to support the building and hopefully provide scholarships for talented youth in art. To this end we are accepting donations towards the foundation. All donations now are tax deductible. 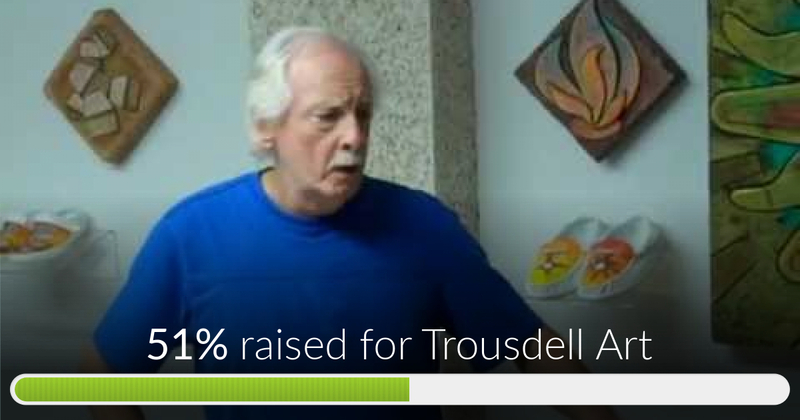 You will receive a certificate in the near future, along with a Don Trousdell memento in appreciation for your support. Anything you can do to help with this endeavor will be greatly appreciated! Once we have a location, we will sell prints, books and possibly other merchandise with proceeds to support the location and hopefully provide scholarships for talented youth in art. To this end we are accepting donations to be placed in the foundation. All donations are tax deductible. You will receive a certificate for tax purposes in the near future, along with a Don Trousdell memento in appreciation for your support. YEAH! We have reached over 50% of our goal towards a huge task – to establish a place to exhibit Don's educational art exhibits for the public to enjoy. Thank you, thank you, thank you. Share with your frineds and let's keep it coming! Hopefully you'll enjoy this early video of Don describing the Walk In Peace exhibit and the images of the first showing. Walk In Peace is one of the exhibits we plan to find a permanent place for in St. Augustine. Enjoy the insights of the creator of the exhibit and the universal message of Peace! Don.....you were a great friend and neighbor of us....we miss you dearly! Every day we look over at the garden where so often we found you caring for your beautiful flowers and plants......and we feel your loss. Every day we see the darkened studio.....no more will we tap on your window and wave and observe in wonder what your latest project is...we miss you Don! But you live on in the beautiful art you have created....and the many lives that you have touched! We really miss our good friend!